Moraira is the jewel in the Costa Blanca's crown and once discovered you will return time after time. Historically a small fishing village it still has 5 fishing boats that land their catch daily and sell fantastic fresh fish and seafood at the popular fish market every morning, except on a Sunday. As you arrive in Moraira you will drive through orange groves and the vines that the Muscatel grapes are growing ready to make wine. Although the town has grown in recent years, becoming one of the most popular destinations on the Costa Blanca, it has not forgotten its roots and the lack of high rise buildings and overcrowding keeps a local feel that is enjoyed by so many returning visitors renting a holiday Villa year after year. The town and beaches are wonderfully clean and pretty with lots of quiet areas to just sit, chill and watch the world go by, it’s easy to park in the town centre, essential if you are on holiday with children. Moraira is now one of the most exclusive and desirable places to stay on the Costa Blanca. It still has all of the charms of a small picturesque fishing town nestled between mountains and vineyards but at the same time has grown to offer almost everything to everyone that stays here and rents a Villa. Moraira has two main beaches made up of clean golden sand and nestled in attractive bays, swimming here is safe and pleasant and the beach is a relatively uncrowded place to be even in the peak of summer and cleaned daily. The main beach is situated right next to the town centre with convenient pedestrian walkways and a park area meaning that it is not necessary to cross any roads to get to the town or the marina from the beach. Away from the beach, Moraira offers a huge variety of restaurants and bars to cater for every taste and budget. Whether you are looking for traditional Spanish cuisine in Spanish surroundings or international cuisines like Chinese, Japanese, Greek, Italian or even just a steak, the area offers it all in style. As the sun goes down and your meal is finished you can always head to one of the many local cafe bars and sit and enjoy a warm summer night, or move on to one of the many bars or one of the town's two nightclubs. With many ice cream parlours and the market night stalls, the evening never has to end. The entertainment isn’t just limited to the evenings, Polar Park, centrally situated, has is a great funfair for children where there are many small rides, mostly suitable for the young but even adults can have fun on the bumper cars and hover boats. Not a fan of the funfair? No problem, the area has activities to amuse all ages. Every Friday morning the market held opposite the town centre is an excellent opportunity to purchase all manner of fresh produce as well as imitation leather goods, clothing, and jewellery. A relaxing stroll around the town is rewarding in itself - the streets are a mix of quaint cobbled narrow alleys and modern avenues lined with palm trees and fountains and there are many quiet places to sit, relax and watch the Mediterranean lap gently along the stunning coastline to Calpe. For the active, Moraira offers an excellent selection of sports to suit all, including jet ski hire, water skiing, deep sea fishing, diving tuition and equipment hire, tennis courts, a golf course, mini golf and mountain bike hire. For the younger ones in your party, there are specially designed park areas to play safely in all around the town. Of course, you are not just limited to Moraira itself for entertainment. Gudalest, Benidorm, Calpe, Javea, Valencia, Alicante, and Denia are all easily reachable, as is Aqualandia, Mondumar, Font D'Algar, Verger Safari Park and Paramount Theme Park or even Valencia for it shopping and culture. Ultimately, whether you choose to lounge by the pool or on the beach, eat at one of the many restaurants or visit other nearby towns, villages or attractions we know your holiday in Moraira will offer you what you are looking for and entice you back year after year. Moraira boasts a Mediterranean climate with over 300 sunny days a year, with an average temperature of 25 degree in the summer, dropping to a fresher 14-15 between the months of November and April. Shielded by mountains it keeps away the strong winds and prevents the town from heat waves. Summers are hot, the winters mild. During the summer months, the sea temperature is a pleasant 25 degrees. If you’re looking to get away from the rain, July and August are the perfect times of year to travel, these months have the lowest rainfall of the year. Getting to Moraira is very easy. The local Alicante airport is a two-and-a-half-hour flight from London Heathrow, from there, Moraira itself is an hour away by car down the AP-7 motorway. Moraira offers a true choice and variety of cuisine from great family restaurants to romantic bijou tapas bars. Whether it's seafood, barbecue, traditional Spanish or something more exotic you will find it on offer. To help you pick we have asked our past guests to send us some reviews of restaurants they have visited and you will find these reviews here on our - Moraira Restaurants Reviews Page. Situated in peaceful surroundings yet conveniently just a short drive from the centre of Moraira, Afiliador is a traditional villa that offers comfortable accommodation that includes wi-fi internet and UK Freesat television channels. Featuring lovely.. 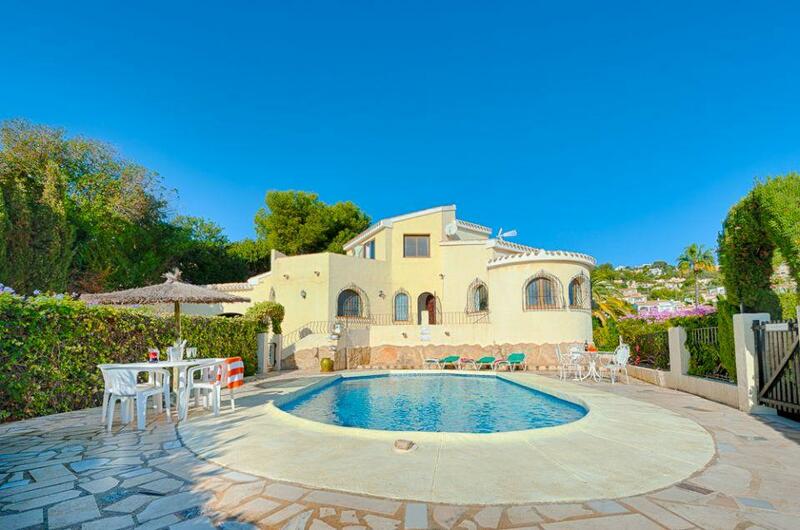 Stunning sea views from this beautiful villa, located on the Benemeit hills above Moraira. Spacious and comfortable accommodation with air conditioning, wifi internet and UK satellite television. A short drive to the beach and centre. A stunning modern property, well situated within walking distance of amenities. Sea views & valley views to the south, vineyard and country views to the north. Spacious and light with all modern conveniences including air conditioning in all bedrooms,..
A very comfortable, traditional style villa with private pool in the sought after Villotel residential area, close to Moraira centre. Benefits from an air conditioned lounge, wifi, UK Freesat television channels, panoramic views to the mountains and beautiful..
A lovely villa with accommodation all on one level, offering tranquility and a panoramic sea and valleys view. Annabella benefits from air con, wifi broadband,UK satellite television channels and a pool table. Superbly situated in a quiet cul-de-sac within walking distance of the beach and centre of Moraira. Comfortably furnished and benefiting from air conditioning. A good option if you prefer not to rely on a hire car whilst on holiday. A quaint villa situated in a quiet cul-de-sac location and within walking distance to bars, restaurants, supermarket and the pebble beach at Baladrar. It forms part of a larger villa, the remaining part being unoccupied during the holiday season for total..
A modern very well presented three bedroom, two bathroom villa with stunning sea views. Two of the bedrooms have air conditioning. Sky TV and WiFi internet. A beautifully presented and private villa arranged as two well-appointed apartments. Far reaching sea views across the valley to Ifach Rock and Golf Course, air conditioned bedrooms, UK satellite TV and wi-fi broadband. Tastefully furnished throughout..